This summer is set to be a good one for hijabis (fashion wise!). Not only is the high street full of maxi dresses, long skirts are popping up everywhere too! Right now Dorothy Perkins especially has lots of pretty skirts in. Try teaming with a lightweight jacket, plain cardigan or denim shirt. These are my four favourite picks, click here to see plenty more. Cream/pink rose maxi skirt £32; Pink ditsy tiered maxi skirt £30; Peach pansy tiered maxi skirt £32; Blue ditsy tiered maxi skirt £30; all Dorothy Perkins. all i can say is wohoooooo!!!! 3-teir skirts are the way to go! 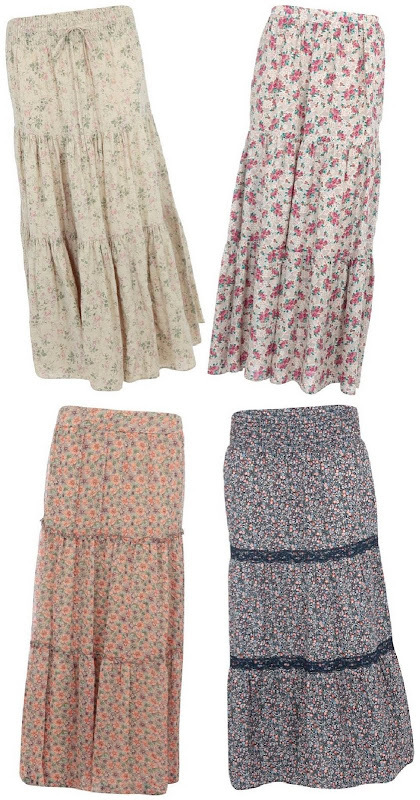 i don't like floral maxi skirts, they like somewhat peasant style, not elegant at all. Floral hijab is ok, but skirt...hmmm.